It’s a heavy load of veggies this week! The new addition of celery adds a little more green to the rainbow. They are the outer stalks we removed from the celery plants as we are cleaning up in that planting – good for flavoring soup or broth, adding crunch to a salad, or just eating as a snack. The lettuce ran out Monday so Thursday folks will be getting some cooking greens instead. This week will probably be the last of the green beans for the season (big sigh of relief from the harvest crew!). The carrots had a bit of vole damage so some of them had to be trimmed up. The onions this week are a sweet onion similar to Walla Walla called “Ailsa Craig.” Supposedly they can get really huge, but ours are sort of a normal size this year. The onions are cured now, so you can store them on your counter or in a cupboard. More tomato varieties are coming in week by week, including some Indigo Apple, which has an unusual blue/purple tint on the shoulders. The “indigo” line of tomato varieties are being bred by OSU plant breeder Jim Myers for high levels of anthocyanins, which are antioxidants. 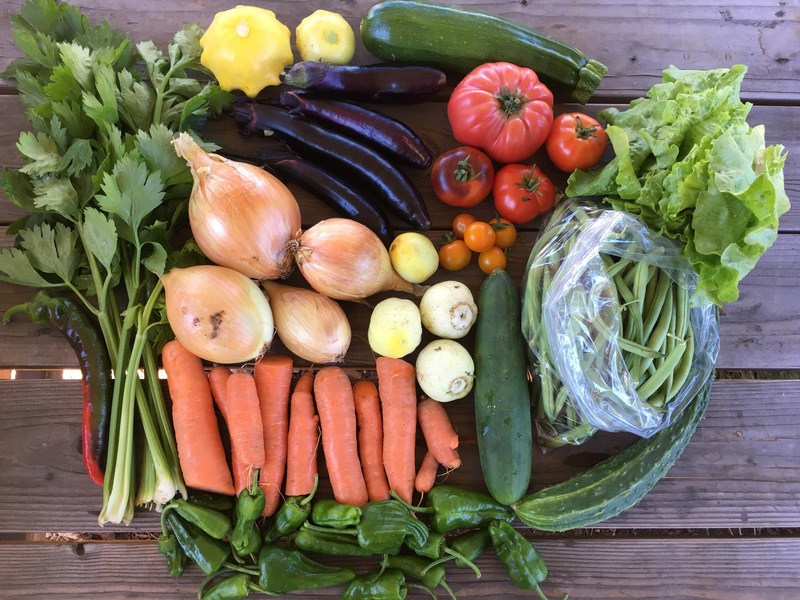 The summer squash and cucumbers keep on chugging along, and the sweet peppers are still on their way in – just one per share this week. If you have a pepper that is only partially red, you can let it ripen up to full color at room temperature for a few days. Padron peppers are an optional addition this week. They are a new crop for us this year and seem to be popular with CSA members as well as restaurants, which is great as they are super productive and delicious. You may have noticed a lack of beets for quite a while now. Our beets and chard have been hit hard by a number of problems, including leaf miners (an insect larva which eats the layer of green inside the leaf), aphids, and lots of weeds. I am hopeful that we’ll have better luck with our last seeding of beets which are about 2 inches tall right now, as we’ve covered them with row cover to avoid the insect pest problems.